Following on from last year’s production of Mother Goose, it was with keen anticipation that I sat down to watch this year’s pantomime offering of Sleeping Beauty at the Oldham Coliseum. The same high production values were in evidence, in addition to slick special effects such as the skeleton dance. Some of the main actors returned from last year including Justine Elizabeth Bailey as Nancy Nutty / Prince Valiant, Richard J Fletcher as Norman Nutty / Dark Knight / Frog, and Simeon Truby as Nanny Nutty. The latter had taken over from the co-writer Fine Time Fontayne as the Dame. I thought that this improved the production, as I felt that Fine Time was somewhat over-exposed last year. With no single actor dominating the stage this year, the show was allowed to breathe more giving other performers more of a chance to shine. Many of the same comic devices from last year’s pantomime were used, which were a little tiresome if you had seen them before. For me the star of the show was Liz Carney as Carabosse who was the villain of the piece. Her performance blended comedy, suitable menace and a good singing voice. The finale of the show took place in her lair which was a homage to Frankenstein, and was very effective. Three groups of young dancers are used for this production. The Red Team were used for this performance and they worked very hard. They certainly added to the energy and enjoyment of the show. All in all I felt that this production was a significant improvement on last year’s pantomime, and included a good mix of adulterated laughs, and fun for the youngsters. The time passed quickly, and the energy and pace of the show was kept up right to the Finale. 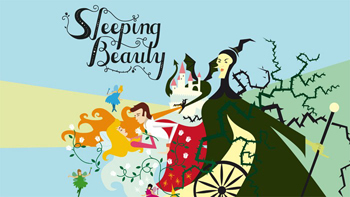 Sleeping Beauty is running until 7th January 2017.